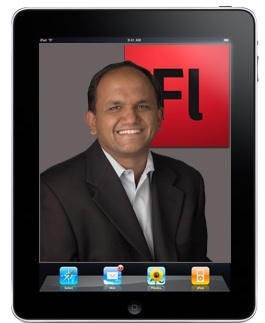 "Apple’s iPad is doomed to fall to competing tablets, and that day is coming soon, according to Adobe CEO Shantanu Narayen. He shared that bit of precognition, along with some other thoughts, this week in an interview at the AllThingsD D9 conference." With the release of Android for tablets (3.0+), many pundits have predicted the demise of the iPad, but it hasn't happened yet. Adobe's CEO states that the decision for Apple to not allow Flash on iDevices, is not really a technical issue, but rather a business decision having to do with Apple's desire for total control over the platform, and over software distribution through the App Store. Um, Adobe, first and foremost, it's about the user experience - Flash has been tested, and runs like crap on iOS devices, so Apple has made its thumbs-down decision. Control issues certainly are there, but a distant second in this case. If Apple's market-leading position falters, I think that it'll be ultimately because of the strengths of Android, a superior user experience, with Flash playing a very minor role at best.